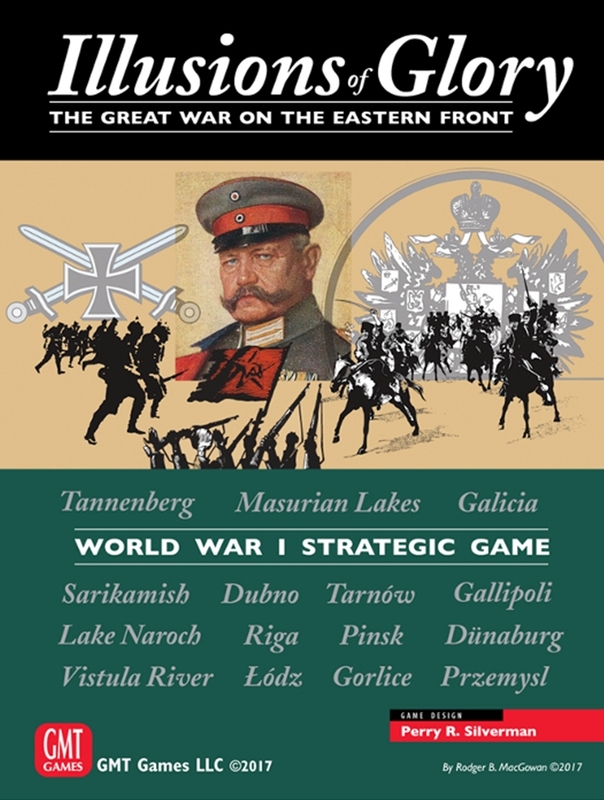 Illusions of Glory�The Great War on the Eastern Front is the latest Card Driven Game to simulate the Great War in Europe. First came the award-winning legendary Paths of Glory by Ted Raicer, which simulates the entire war in Europe and the Middle East which is now a convention favorite. It was followed by the well-received Pursuit of Glory, designed by Brad and Brian Stock, which focuses on the war in the Near East. Illusions of Glory takes this proven game system to a new and exciting level by applying its focus to the Eastern Front. The Allied Powers bring massive forces to bear against Germany, Austria-Hungary, Bulgaria, and Turkey while trying to prevent a game-changing revolution in Russia. The Central Powers must defeat Russia, hold off Italy, and win the upper hand in the Balkans or face demoralization and rebellion at home. Players test their generalship and strategic abilities as Illusions of Glory lets you recreate the dramatic events of World War I�s Eastern Front.